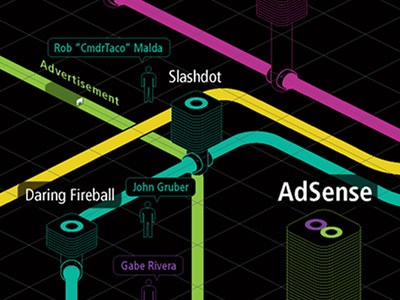 In 2007 the strategic design agency Information Architects (iA), based in Tokyo, Japan, launched their first Web Trend Map (of a future series of 4). Although they were candid enough with their first version, stating that it was "totally unscientific and almost useless, but definitely fun to look at", they ended up realizing the popularity of the project. What started as a playful Christmas gift for their clients, quickly became an expected yearly publication by iA, with the authors becoming more serious and laborious with each new iteration. This yearly publication maps the 333 most influential Web domains and the 111 most influential internet people onto a series of alternated versions of the Tokyo Metro map. 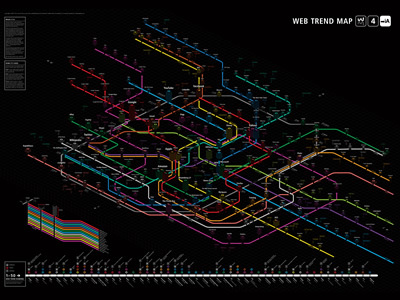 Shown here is the fourth version of the Web Trend Map, released in April 2009, and revealing a considerable graphical departure from previous versions. You can see them all side-by-side on this blog post.